Puente (Spanish for bridge) students enjoy an exciting and supportive learning experience while studying at Sierra College. The Puente program is sponsored by the University of California, Office of the President (UCOP) and the Chancellor’s Office of the California Community Colleges. Puente (Spanish for bridge) has provided tens of thousands of California students with a vision of success and the support to make that vision a reality. To increase the number of students who transfer and enroll in four-year colleges and universities, earn their degrees, and return to the community as leaders and mentors of future generations. 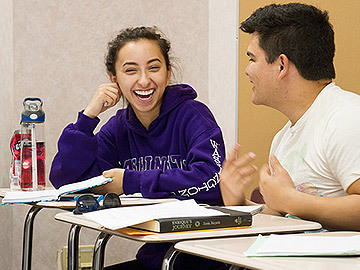 Puente students enjoy an exciting and supportive learning experience while studying at Sierra College. More information about this nationally recognized program can be found at UC Berkeley. The Puente Club of Sierra College meets each Monday, 2:00-3:00pm, in the Cross Cultural Center during the fall and spring semesters. Everyone is welcome! Spring semester: English 1C and History 23. The content of the Puente classes and assignments focus primarily on topics about the social, cultural, historical and educational experiences of Latinos/as in the United States. Read the Puente English success rate. Dr. Reyes Ortega provides counseling services and helps students gain an understanding of the complexities of higher education. He also teaches classes for students to gain an appreciation of Mexican American and Latino/a history that begins with the Olmec, Maya and Aztec cultures to the present. Originally from the San Francisco bay area, Dr. Ortega’s extended family comes from the state of New Mexico and from the state of Guanajuato, Mexico. As a first-generation college student, he draws from personal and professional experiences to help others understand the value of higher education. English professor Jason Roberts is very well known for his success at helping students develop critical writing and thinking skills. 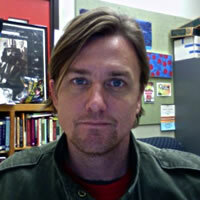 After two years at Sierra College, Professor Roberts earned his B.A. in English with an emphasis in Creative Writing from California State University, Long Beach. He also earned his Master of Arts degree in Language and Literature from the University of Tulsa in Oklahoma. Professor Roberts received the distinguished 2015-2016 Faculty of the Year Award from the Associated Students of Sierra College and continues to experience exceptionally high success rates for students. A Puente Counselor and Personal Development classes designed for Puente members. This is a great opportunity for students to begin networking with local professionals who can share career information and educational opportunities. Puente students take field trips to universities and attend off-campus cultural events. Puente students who have transferred to universities. Complete the Puente Information Form and submit them to Dr. Reyes Ortega (reyesortega@sierracollege.edu) or Professor Jason Roberts (jroberts@sierracollege.edu). Information Forms can also be mailed to: Sierra College, Counseling Department, 5100 Sierra College Blvd., Rocklin CA 95677.